You have about 2200 cycles per vblank (113⅔ · 20) for everything that needs to be sent to the PPU. Updating sprites (OAM DMA) takes roughly 1/4 of that. CC65 is probably adding some overhead, too. Yup, looks like that's the problem. The question I have is, is it safe to call set_vram_update(); when the PPU is on? I need to literally update different areas of the screen, depending on different events, score change, worrior doors opening, teleport happening, etc. If I can't call set_vram_update() while ppu is active, will I need to roll my own little queuing and scheduler code for this? I think you can call set_vram_update whenever you want, that's just setting a pointer and the actual PPU update is done by neslib's NMI handler (which will run at the next vblank). The problem is just that the NMI handler has no way of safeguarding against or helping to diagnose the "too much data takes too long" case. I believe all the neslib functions you can't call while rendering is on are labelled as such in the header. If you need all of those updates to happen in one frame, you could write a custom assembly NMI handler that can get that much data through in a single vblank, but the library's generic one is not efficient enough to do it. Otherwise you can break up your updates so you only have to do some of it each frame. The solution is making your vram_update array dynamic, fill it with what you need to change for that frame, and let the NMI handler do its magic. I'm sure you don't need to update everythign every frame, so this just works. Here, UPDATE_LIST_SIZE = 32 works for me (more than enough!). ul is a pointer we'll use to update the buffer. ... do your game logic, write to ul, increment ul. I'm sure just a number of things will fill the buffer each frame, so this will work and you won't run out of VBlank time. I'm just curious as to how the result frames on a tube. An LCD will probably show the Action Safe Area almost exactly. The average CRT will show somewhere between the PocketNES Safe Area and the Action Safe Area, but older CRTs or CRTs in poor shape might not show much out of the Title Safe Area or might show some of the Danger Zone. I just wanted to see how tight my tolerances are, since I do not have a toaster or a tube anymore. 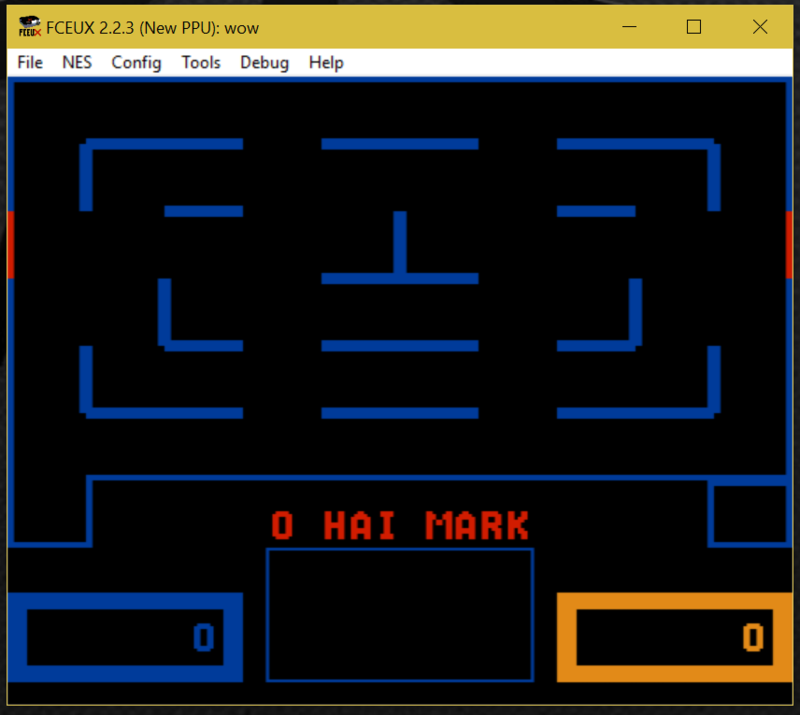 * player = Player 0 (blue) or Player 1 (yellow) door. * openclose = 0 for open, 1 for close. // And then set the tiles for each update depending on desired door state. * 8 objects on screen, two players and 6 enemies. 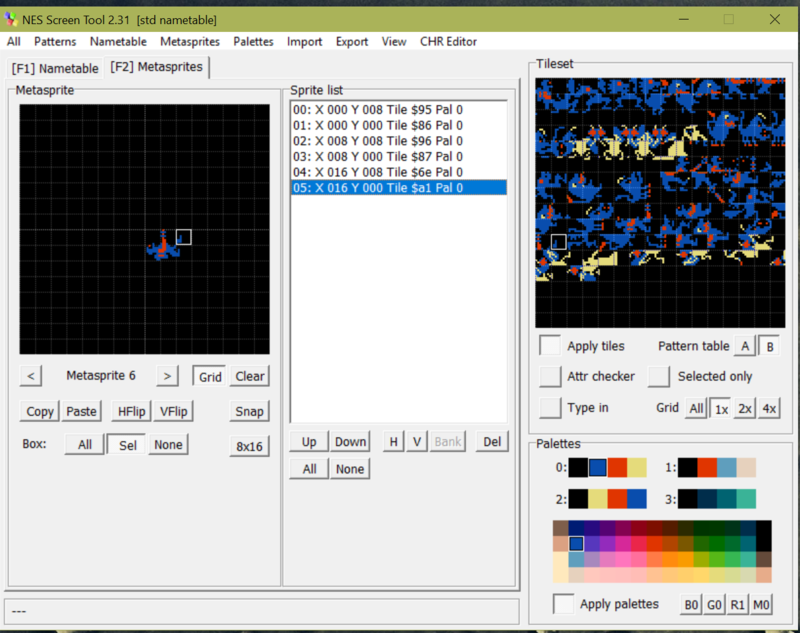 Needed more room in my sprite chr bank, so I used NESST's remove duplicates feature. Fantastic feature indeed..in fact, both YYCHR and NESST are fantastically indispensable tools, hats off to Shiru and YY. Now, assembling metasprites is like a twisted jigsaw puzzle. yay. 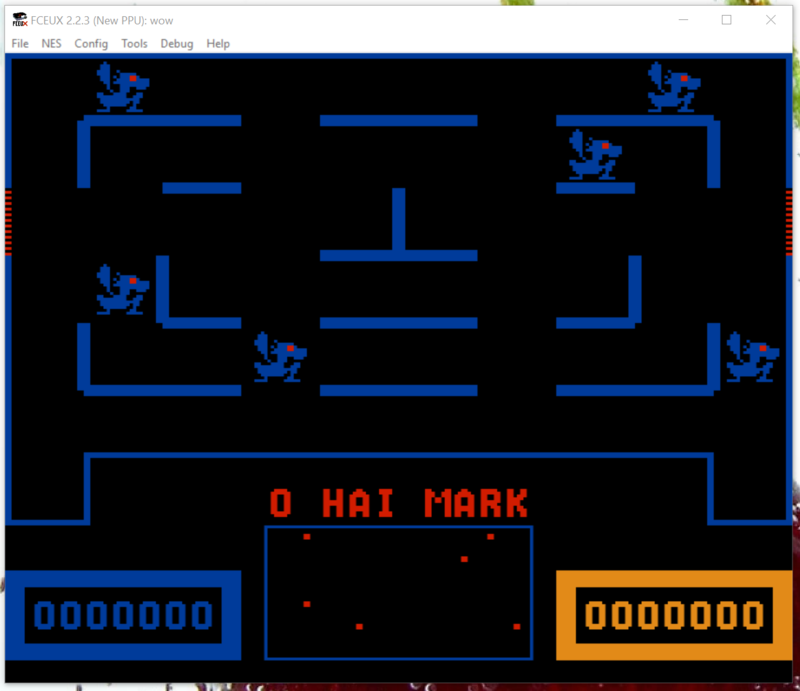 Now status is slowing down a bit, as I slog through entering tables and data for animation and start implementing the frame loop for the main part of the game. If I need something better, i'll write it. I've gone through and implemented almost all of the sprites, save for the wizard, as I am needing to decode the bitplane format used on the Astrocade, to grab the blitter object for the wizard from the ROM, as I have tried to frame grab it, like the other character objects, and as it happens, the blitter object is munged a bit to blur it, making extraction of anything other than the one visible object on the character description page difficult. Worst case, I will just #@($#@ draw it based on the blurry (#@$#@ images. I've also implemented the animation state tables which will be used to select which metasprites to use for a given state, and have enough to where I can do a naive first pass at filling in the OAM on each frame. I believe the game uses four frames for each animation state, with two of those frames duplicated to create a sort of slight cyclical pause that is visible at slower speeds...it certainly makes it easy to cycle through the frames in the state list, as I just have to AND it off. I've also implemented the red/blue dungeon palette swap that is needed to differentiate certain states (worluk/wizard visible, or you're now in a Worlord dungeon), as well as the Double Score win color cycling. Radar is implemented as background tiles, saw no need to waste perfectly good sprites for it. #define STAMP_STATE(x) (STAMP_NUM(x)+3) // Stamp Field: state (which frames to use). This implements a very simple "patrol my space" AI, which I may want to change to alter direction when there are no walls in a box, or something similar. Have posted a quick build for others to enjoy looking @, code is on github, and am continuing on.